Warning some comments may contain a plot spoiler! By reading these comments some elements of the story may given away. A very moving story. Tom returned from the war a Military Cross hero. But felt he had let down his mates having survived when so many perished. Isabel married him as a young bride and went to live on Janus. Life was very hard but they were happy. The years that followed brought many heartaches – the loss of 3 babies was almost too much to bear – so when a boat washed up on shore with a deceased man and a live baby, they decided to keep the child and rear her as their own – who would know the difference. Fate stepped in when they accidently discovered the identity of the baby Lucy’s parents. The birth mother claimed her child and Tom and Isabel were forced to sever all ties. They, lived out the rest of their lives quietly, then after Isabel’s death Lucy found Tom and she read the letter from Isabel – she still remembered her times on the island with them both. I think when Lucy (Grace) visited Tom and he held her newborn son – it gave him peace and hope – the same way she did when he an Isabel found her in the boat all those years ago. 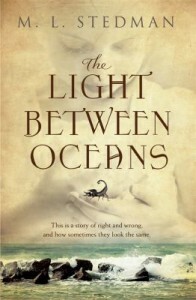 This entry was posted in Australian Authors, Fiction and tagged Author, Book Club, book review by admin. Bookmark the permalink.